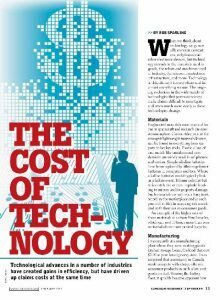 Technological advances in a number of industries have created gains in efficiency, but have driven up claims costs at the same time. When we think about technology we generally envision computers, cell phones and other electronic devices, but technology extends to the materials used in goods, the robots and machines used in industry, the telecommunications infrastructure, and more. Technology is ubiquitous; it is everywhere and in everything we use. The ongoing evolutions in the wide variety of technologies that permeate society make claims difficult to investigate and often much more costly as those technologies can change. While technology has obvious benefits to society, its increasing complexity challenges the insurance industry. Where objects, materials and processes were historically simple, they are now often complicated systems which require experts to understand them. Failures of small components can have very extensive repercussions for larger systems – shutting down large offices and assembly lines. This makes assessing risk, investigating claims and subrogation much more difficult and costly. Brokers with clients in technology-driven industries are advised to closely monitor developments and review the adequacy of coverage regularly.